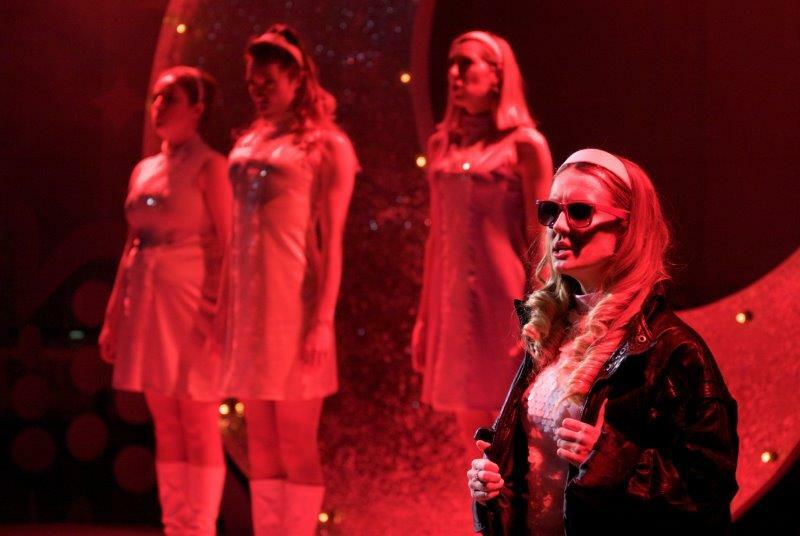 Sugary sweet musical inspired by 1960s and 1970s, The Marvelous Wonderettes is a perfect nostalgic show. Staged previously off-Broadway in New York, it now comes to Upstairs at The Gatehouse theatre in North London. 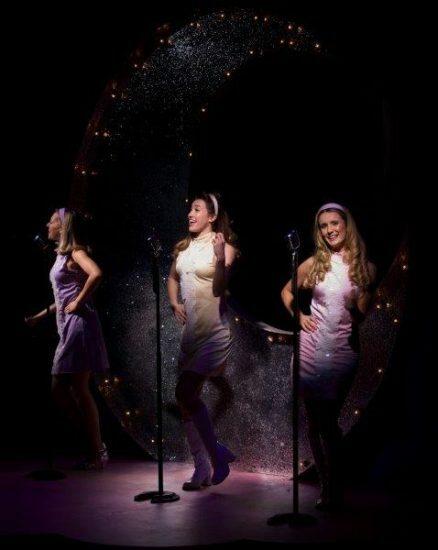 More a concert with small interludes and side stories than a full blown musical, the show tells us a story of four girls, who sing in a band called The Marvelous Wonderettes. We meet them at the school prom during the first act. They share their dreams and future aspirations, presented as a chain of 1960s songs. After the interval, we become the guests of another their performance, staged 10 years later at the school reunion. The 1970s tunes and four quite predictable stories of dreams coming true and hearts being broken. While the plot is simple and easy to anticipate, the acts are full of charm and involve the audience, which makes show lively and engaging. The main attraction of this production is its retro stylistics. The choice of songs is perfect: over 20 of them were top of the charts in the past decades, and the most famous titles are Mr. Sandman, Lollipop, Stupid Cupid, Lucky Lips, Love is like a Heatwave, Son of a Preacher Man and Rescue Me. The costumes and choreography support the tone. Crinolines and ballroom shoes, headbands and lacquered boots, – their looks unmistakably represent the decades. Everything clearly reflects the chosen epochs, bringing up nostalgia for elder members of the audience and the joy of recognition for those who are younger. It was interesting to notice how much lifestyles and attitudes of an average American changed in just a decade. While the girls still sing their cotton-candy songs about love and despair, the themes of female empowerment and women emancipation sound clearly through the second part. The 1970s bring up biker outfits and disco moves while the 1960s are filled with sweet candy songs and doll-like girls who are most proud of their beauty and housekeeping skills. The show definitely benefits from strong vocals of all four actresses along with decent comedy acting by Louise Young (Betty Jean) and Sophie Camble (Missy). The light, set, and costume design helped to create the right mood. Overall, it was a lovely production that feels to be in its place in that cozy little theatre. The Marvelous Wonderettes is a nice entertaining show, which would be equally loved by modern teens and their grandparents. While the former will dive into the set of their favorite American films and TV series, the latter may travel back to times of their youth. I could notice quite a few ladies in their 60s or 70s singing along all the way through, and that’s what makes it perfect entertainment for the whole family.